T-Rail benching is the method of choice for most vegetable plant propagators to hold the trays off the ground, away from standing water and up to within comfortable reach of anyone working. T-Rails also allow the trays to slide along their length for ease of loading and unloading. T-Rails are generally uprights with a horizontal upside-down-t-shaped bar connecting them. As rails can be incredibly long and numerous, it is vitally important that they are spaced to the correct amount on installation, or trays may not fit as expected. Adjusting T-Rails is a tedious job – getting it right the first time will mean an efficient nursery and less disgruntled staff! There are many, many trays in the market, both injection molded and Styrofoam and the length of these trays can vary by quite a large margin. Therefore, your T-Rail benching system needs ideally to accommodate all the different tray lengths, or a policy on tray length must be decided by the nursery at an early stage. Add to this the fact that the distance between T-Rails when installed will vary slightly due to installer variation it is important therefore to set the benching up correctly in order for the system as a whole to work. There is typically a lip on each side of the T-Rail (photo 1) to allow for some variation and create wiggle room on both tray length and T-Rail setting. This lip or shelf can be as small as 15mm (0.59”) wide so ensuring right spacing to accommodate all tray lengths is very important to prevent any trays jamming or any trays falling off because they are too short. 2.Put some parcel or masking tape around the whole outer wall of the tray repeatedly until about 20 layers have been built up. This should effectively make the tray a little bit longer i.e. roughly 3mm (1/8th inch). 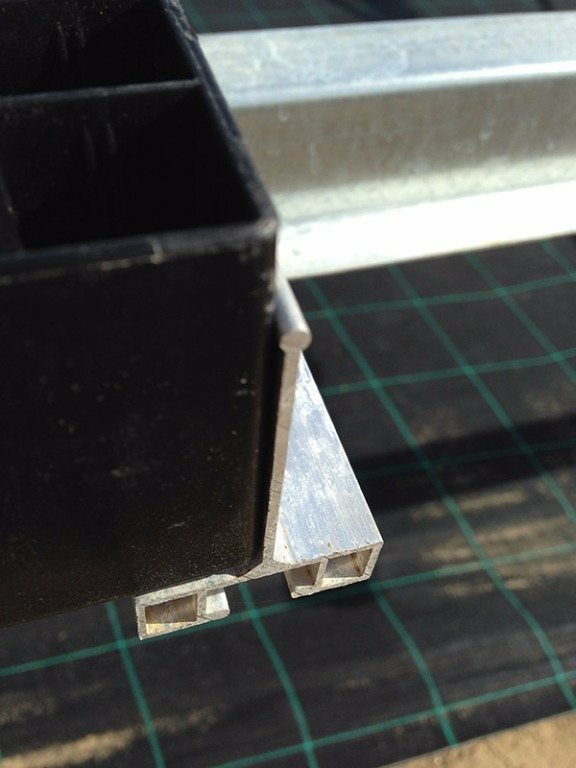 4.Using taped tray, ensure the next rail fits snuggly up against the tray without being tight. 5.Repeat this process down the rail, checking at every upright that the taped tray is still snug without being too tight to bench or slide freely between the rails. If you assume there is a plus or minus 2.5mm error then this will ensure that the second rail is put in a position where the longest tray can be accommodated relatively loosely and the shortest tray e.g. 660mm (26“) will not fall off.